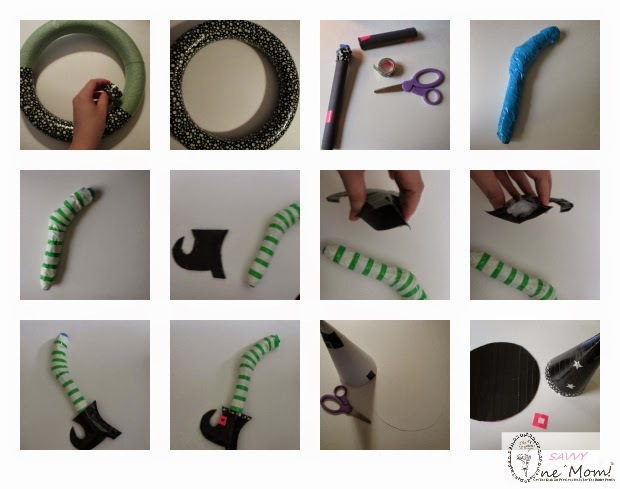 One Savvy Mom ™ | NYC Area Mom Blog: Duck Tape Witch Halloween Wreath Tutorial - It Glows In The Dark! 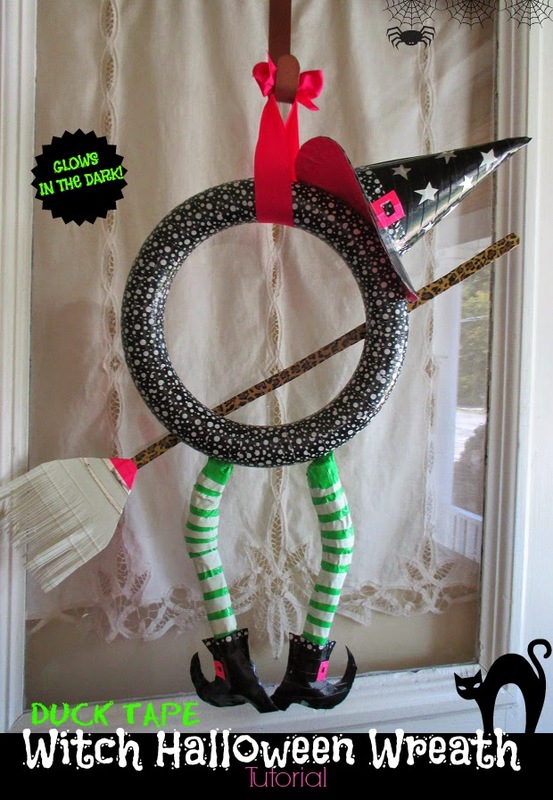 Duck Tape Witch Halloween Wreath Tutorial - It Glows In The Dark! Ready for some Halloween fun with the kids? This year, for the first time, I actually really decorated the house for Halloween. We normally decorate for the Fall season however, we never really went all out for Halloween. After Halloween, I will have to change everything out for Fall and Thanksgiving, but the kids are loving all of the décor, and that's what it's really all about! So, I'm going with it. We crafted this fun (and simple) Duck Tape Witch wreath yesterday. It's comprised of very simple materials. And our favorite part? It glows in the dark! At night, all you can see is the glowing tights on the Witch legs, the broom, and the stars on the Witch hat. Seriously, SUPER CUTE! Duck Tape Ducklings™ Mini Rolls of Duck Tape in choice of colors (we used 2 rolls of Glow in the Dark for stars on the hat, the broom, and the witches tights, 1/2 roll of hot pink for the underside of the Witches hat + shoe/hat buckles and top of the broom, 1 1/2 rolls of black polka dot for wreath form and accents on hat and shoes, a few pieces of leopard for the broom handle, and a few pieces of silver for the top of broom / stars on the Witches hat, 1 roll of black for the Witches hat and boots). Roll two pieces of black construction paper (as pictured below). Secure with tape. Cut roll into 5 and 2 inch sections. Ball up a small piece of paper to create "knee joint". Tape all three pieces connecting 2 inch piece to "joint" at top for thigh and 5 inch piece to "joint" for calf. Cover entire "leg in Duck Tape. Cut strips (about 3"L) of green / glow in the dark Duck Tape and layer as pictured to create the Witches tights. Layer until the entire "leg" is covered. Repeat for other leg. Cut out two witches "boots" (two for each side) staple boot along outer edges (leaving the top open for the leg to fit in ( refer to picture below). Cover both sides of both "boots" with black duck tape or color of choice. Embellish with a small square of another color to create a buckle on each boot (refer to picture below). Use hot glue or heavy craft to glue the witches legs inside of the boots. NOTE: Use straight pins to attach the witch legs and completed hat to the wreath form. Refer to our tutorial below to complete all of the steps of this project. It only took me about 45 minutes to complete the wreath from start to finish.